Making Waves Swim School encourages all families that plan activities in or near the water to designate an adult as “Water Watcher” whenever children are present. Never assume that someone else is watching your child(ren). Many drownings occur when there are others around just because no one adult took responsibility as a Water Watcher. 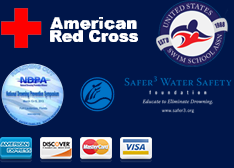 A Water Watcher should be a responsible adult who knows how to swim and is also trained in basic CPR and First Aid. Making Waves Swim School offers adult lessons at all of our locations and we would love to help you become more comfortable in the water. There are also organizations that teach CPR and First Aid, such as the American Red Cross and the American Heart Association. Please click on their names to learn more about opportunities in your area. Multiple adults can share the responsibility of Water Watcher by switching every 15 to 20 minutes, which helps prevent fatigue. The designated Water Watcher should wear something to help remind himself/herself and others that he/she is not to be distracted. A bright shirt, hat or lanyard are just a few examples. The Water Watcher should be close to the water’s edge at all times to have a good view of the entire area. They should not leave unless relieved by another Watcher. If the Watcher must leave, he/she should take all children out of the area also. It only takes a moment for a child to drown and Watching from outside the area or from an inside window just isn’t close enough. A good Water Watcher constantly scans the surface, middle, and bottom of the water and keeps a head count of all children present. The Watcher should also avoid all distractions, including, but not limited to, reading, texting, and conversations with others. Always keep your eyes on the children and keep non-swimmers within arms reach. A phone should be kept in the area for emergency use only, don’t let it become a distraction. •	Completely fence in the pool area. The pool should be enclosed on all 4 sides by a fence that is 4 to 5 feet tall and has a self-latching gate. •	If your home forms one side of the pool enclosure, use door and window alarms to alert you if someone enters the pool area unsupervised. •	Use a pool alarm to alert you if the surface of the water becomes disturbed by a child falling in. •	Remove all toys from the pool enclosure after use. This will prevent children from trying to get back in the area for their toys. •	Remember that flotation items such as swimmies, noodles, and rafts are NOT lifesaving devices and should NEVER be used as a replacement for adult supervision. •	Enroll your children in swimming lessons. Knowing how to swim won’t make them “drown-proof,” but it will help give them a better chance. Always follow these guidelines whenever you are near water, no matter how little. It only takes 1 inch of water for a child to drown. Any near-drowning experience can have lifelong consequences. It is easier to take the time for prevention.